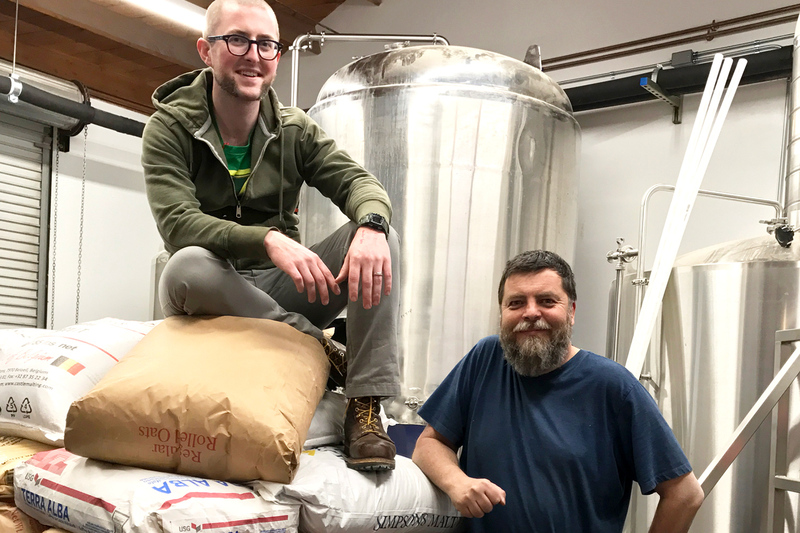 York Square Brewing’s C. Andy Black, left, and Gary Croft in the Torrance Brewery last year, about a month before its opening. Photo by Tomm Carroll. A young craft brewery could not wish for a better birthday gift than to find itself listed among the 50 Best New Breweries of the United States and Canada — and on the eve of its first anniversary celebration. Yet that is precisely what happened to Yorkshire Square Brewing of Torrance, California, which opened exactly a year ago, and holds its birthday party at its taproom on Saturday, May 5. Yorkshire Square president and co-owner Gary Croft was actually tipped off about the honor a few days before May 1 (fittingly the first full day of the Craft Brewers Conference in Nashville), when the folks at BeerAdvocate released the list, which the website and national publication has been compiling since 2011. Breweries only qualify for the distinction within one year of opening their doors. Yorkshire Square, a production brewery specializing in traditional, British-style cask-conditioned beers (aka real ale) with a (rare in the U.S.) Cask Marque-certified taproom, is one of only four California breweries to make the cut, and the sole brewery in Los Angeles County. “It’s quite humbling to see Yorkshire Square honored on a list alongside some truly outstanding new breweries across the continent,” Croft said in a statement announcing the brewery’s inclusion on the list. Green Cheek Beer, in neighboring Orange County’s eponymous city, SouthNorte Beer in San Diego, and Wild Barrel Brewing in San Marcos were the only other Californian breweries that made the list. Cheers from cyberspace! Thanks for following To Live and Drink in L.A. on the new Celebrator website! And since the last installment of this column that appeared in the February-March 2018 issue — our final print edition, celebrating this beeriodical’s 30th anniversary — was entirely devoted to summarizing the past three decades of good beer in Los Angeles, we’ve got some catching up to do. The Dankness Dojo, the brewpub and coffee roaster, from San Diego’s Modern Times brewery, that opened downtown in January. The place is so small, and the lines were so long to get inside — well into February and beyond — that many craft beer fans (this writer included) have still not managed to get in to pay a visit. Hermosa Beach now has two breweries – sorta. Joining Abigaile Restaurant & Brewery is the Hermosa Brewing Company, a small space on Hermosa Ave. that opened in February. It’s actually a tasting room and restaurant, as owners Dave Davis and Jorge Delgado contract brew at Rouleur Brewing in Carlsbad and serve its beer too, as well as guest brews. The city of Hawthorne got its second brewery as well when Common Space Brewery launched in the beginning of March — and right across El Segundo Brewing for Los Angeles Ale Works. The massive industrial space features a 30-bbl brewhouse along with a tasting room and outside beer garden deck. Partner and brewmaster is Kushal “Kush” Hall, formerly of San Francisco Speakeasy Ales & Lagers. March also saw the much-anticipated second location of the tiny Highland Park Brewery, a spacious standalone building on the outskirts of Chinatown, which opened in March. A bona fide brewpub, the new space offers guest beers alongside co-founder and brewmaster Bob Kunz’s exquisite brews. There’s also a full kitchen — and a patio. Not to be outdone, nearby Gardena now also has another brewery besides State Brewing (which finally opened its long-awaited tasting room in February despite brewing beer for two years! ): Ximix Craft Exploration Brewery. Pronounced “zim ex,” the new production brewery on Harvard Place came on line in early April, and Erik DeBellis, formerly of Coachella Valley Brewing and Babe’s Brewhouse, is co-founder and head brewer. Rock star Dan Regan of Reel Big Fish, a Long Beach native, has fulfilled his dream of opening a brewery in his hometown when Liberation Brewing Company, with Eric McLaughlin (formerly of Ohana Brewing) as brewer, began brewing officially in late March at its location (and old 99¢ Store) in the Bixby Knolls/Cal Heights neighborhood. Soft opens began in mid-April, with a grand opening planned any day now. That’s it for now. Check this space regularly, as it will be updated often — at least more than the bi-monthly print edition!